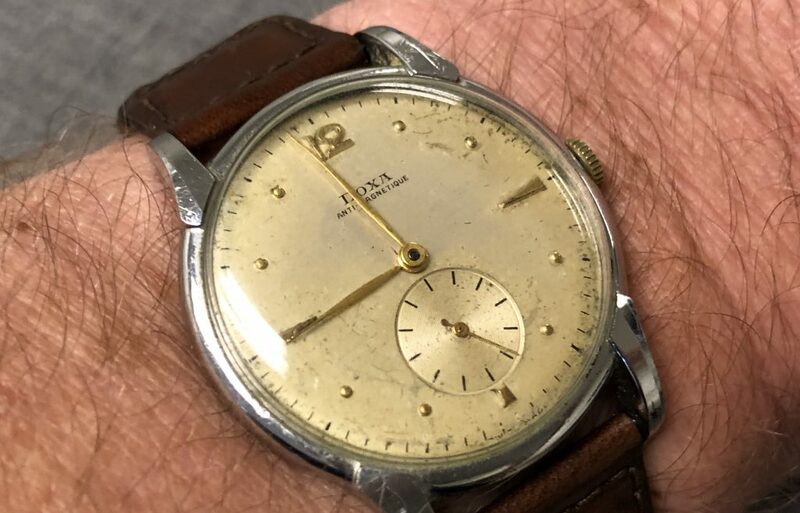 In my wristwatch rotation is a newly acquired 1949 Doxa (Swiss Made of course) with a sub seconds complication. Think about that. The watch is a mechanical wind that is 69 years old. It keeps incredible time for such an old piece that hasn’t been serviced since I don’t know when. The accuracy is probably up there with my Rolex from the 90s. The power reserve is about 50 hours. Think about that too. This thing is a delicate, beautiful little dynamo! It’s on the small side for my wrist, but I love it all the same. It remains on the braided brown leather band that it came with, but I’ll be swapping that out for another soon. I initially ordered some 18mm Nato straps, but now that the piece is in my possession, I don’t think a Nato strap will work. The dial and it’s markers and hands are simply too delicate in my opinion. Once the straps arrive, I’ll be able to better assess once they arrive.